According to many Christian apologists, we have good evidence for the truth of the resurrection. Two things in particular are usually mentioned: First, that many of the followers of Jesus were willing to risk their lives in order to spread the gospel. And second, that the discovery of the empty tomb was made by women. That the disciples risked their lives, and in the majority of cases ended up being executed, shows they really believed in Jesus’ resurrection, for who would be willing to take things that far for something they did not believe? 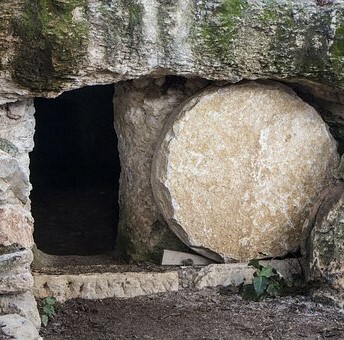 That women were the ones who found the empty tomb shows that the story wasn’t made up, since women weren’t trusted as sources of information in those days — and thus, if anyone were making up the story, they would have said it was men who made the discovery. These arguments are, of course, extremely weak. But rather than criticizing them directly (for that, see for example my book The Truth about God, pp. 68-72), I’d like to pose a question regarding miracle claims in other religions. Let’s take Buddhism and Islam as examples. Immediately after birth, he was able to walk and talk, and in addition, every place he set his foot a lotus flower immediately appeared. Perhaps more amazing, he was able to shoot flames out of one half of his body while water emitted from the other half, then switch halves and repeat. All of which shows, I'm sure we can all agree, that the Buddha was a pretty cool dude. But even these miracles cannot measure up to those of Muhammad. The prophet, as everyone knows, flew to Jerusalem on a winged horse (or horse-like animal), then up to heaven and back. Less known is that he could understand the language of animals and that his body did not cast a shadow. Most amazing of all, he once split the moon in two, so that one half was in front of a mountain and the other on the back. Now, most of these claims are comparable to those made about Jesus, and to the resurrection in particular. My question, then, is this: If you maintain that the above evidence is good enough to show that Jesus rose from the dead, would you accept the same kind of evidence for any of the claims of these other religions? In other words, if it had been women who reported seeing Muhammad flying on a winged horse, or if Buddha’s original followers were willing to die for their belief that lotus flowers bloomed wherever he walked, would that convince you of the truth of those things? Note that to reply that women didn’t report any of these things, or that followers didn’t die for any of these claims (or did they?) would be beside the point. The question I’m asking has nothing to do with what actually happened. Rather, the question is whether that type of evidence would be sufficient for such claims. If the “fact” that women discovered the empty tomb, along with the disciples willingness to die for him, is sufficient to show that Jesus came back from the dead, then women reporting Muhammad’s amazing flight, along with his followers willingness to die for that claim, should be sufficient to show that there really once was a flying horse. But would it be? Franz Kiekeben is a former lecturer in philosophy and the author of two books on atheism, The Truth about God, and Atheism: Q & A. He has also written for Skeptic magazine and published academic articles on determinism and on time travel.